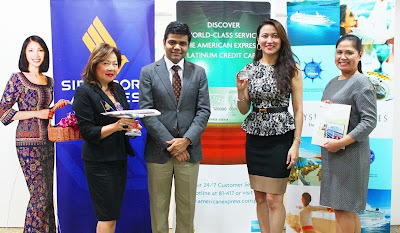 (L-R) Rita Dy, Manager Marketing & Communications; Ranjan Jha, General Manager of Singapore Airlines; Corinne Astillero, BDO First Vice President and Consumer Lending Group Cards Marketing Head, Consumer Lending Group; and Lara Santos, General Manager of American Express Transnational. In a first of its kind partnership, Singapore Airlines, American Express and Crystal Cruises are offering the best luxury packages coined as “Fly & Cruise in Luxury”. American Express Card members can enjoy as much as 50% savings on both air and cruise components, which include roundtrip all-inclusive airfare on Singapore Airlines Suites, First or Business class and all-inclusive cruise experience on board the 6-Star, all-suites Crystal Cruises to over 20 voyages covering South America, South Africa, Europe, Southwest Pacific, Asia and more. The Fly & Cruise in Luxury promotion fares start from USD 5,726 for a 12-day cruise from Bali to Singapore. American Express Card members can also avail of additional savings of as much as USD 1,500 per person for bookings made until October 30, 2013. This promotion runs until May 2014. For more details, visit www.singaporeair.com, www.americanexpress.com.ph, or call Adventure International Tours, Inc. (doing business as American Express Transnational) at (632) 884-9403 / 884-9427 or 38. BDO is the exclusive issuer of American Express® Cards in the Philippines.